Have suggestions for products that you’d like to see reviewed by our real estate technology expert? Email Craig Rowe. To what extent are you really using your CRM (customer relationship manager)? Is it an every day, all-day level of engagement? Or, like most of us, are you only logging in to find an email address? Or when you get desperate for a lead after some silly cold-calling coaching plan crumbled? It’s understandable. Enterprise software investments can be as daunting operationally as many are financially. This is why I so often discuss user interface quality and visual ergonomics in these columns. People have to want to use software. What if I told you that there’s a simple email plugin that can do the most important tasks of a CRM without asking you to change the way you work? FollowUp.cc is all about engagement. Once on board, you can’t not use it. The software functions essentially as an email plugin, but with a great deal more capability. You simply forward to the future any message in your inbox to a “@followup.cc” domain, using a specific time as the user name. Let’s say your mortgage broker contact sent you information about an unrepresented couple that had some general qualification questions. You’re assured they’re a good lead but that it’s going to be a few months before they act. Using FollowUp.cc, forward your buddy’s email to “3weeks@followup.cc” and then delete it. Reminder set. If you want to act faster, send it to “tomorrow@followup.cc.” The scheduling options are almost endless. Using FollowUp.cc is like controlling time without needing 1.21 gigawatts. It keeps you accountable for your procrastination. When it’s time to get in touch, FollowUp email reminders come embedded within the native conversation. Or, you can choose to have it sent separately. I think it’s best used when the reminder is sent within the context of its purpose. You have the option to include any attachments in each follow-up. FollowUp.cc lets you add a custom subject line prefix to reminder messages so they’re immediately recognizable as an action, a great benefit when Gmail’s stacked conversation threads become too cumbersome. FollowUp.cc has an extensive list of email shorthand to make your reminders simple to set-up. Because the address variables are many, FollowUp.cc offers a cheat sheet you can print or bookmark. If that’s not for you, send a blank email to “auto@followup.cc” to trigger an auto response that copies back to you the most common scheduled timeframes. By responding again, all of these time addresses are dropped into your contacts so they’ll auto-complete as you draft a message. Slick. By setting up daily or weekly reminders using FollowUp.cc, you can also use it for tasks that don’t emanate from an email conversation. This is an ideal way to follow up with various stakeholders leading up to a closing, or to tell yourself to call your listings with a showings update. Or that it’s your daughters’ birthday. For agents who track potential relocation customers with longer buying windows, use a “monthly@” or even “yearly@followup.cc” address. Since FollowUp.cc embeds its reminders within the communication chain, why re-key every note into a more advanced, more expensive CRM? 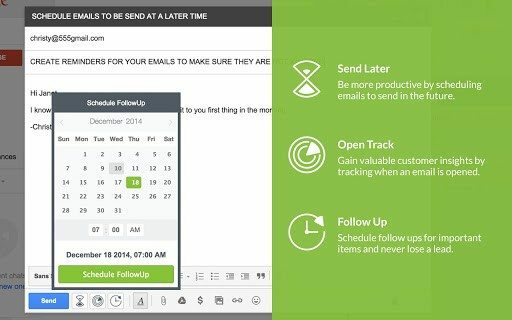 You can also get email tracking capabilities with FollowUp.cc. I’ve personally never seen value in knowing when someone opens an email. Opening a message and digesting its content are two entirely different things. I open emails all the time just to find a reason to never hear from that person or business again. What would a follow-up tool be without a snooze button? FollowUp.cc includes a small window of optional follow-up times in each message. Pick one and move on. I like this kind of flexibility at my fingertips. Real estate transactions are fraught with delays and missed deadlines. When the mortgage broker tells you to call next week for another update, you can snooze that call for another seven days in two clicks. Any FollowUp time address can also be entered into the BCC field so clients and vendors don’t know you’re already planing on future outreach. This puts the sales action directly at the point of engagement, a very effective way to streamline how you manage business processes. Moreover, you can also schedule reminders for an entire team by simply entering the appropriate timeframe in the CC field of any multi-party email. I think it defeats the purpose to have a daily summary of outstanding reminders sent to you, but FollowUp.cc provides that option. I think the intrinsic value of an automated reminder tool is the initial task being out of sight until its due to be addressed. Still, this is only an option, not the default. While you don’t have to sign-on to your FollowUp.cc account to use it, when you do, you’re presented with a calendar view of future (and previous, if desired) reminders. You can sort these by email address and scan forward or back several months. FollowUp.cc is smart, productive software. You can pick it up in minutes, then take time to get a handle on the more advanced features. Even those come quick. It will help you the first day you create an account. You can combine FollowUp functionality with document management tools like Box.com and Google Drive, as well with Evernote and your SalesForce account. However, I like FollowUp.cc just how it is, always there, always easy. For agents not enamored with large software buys or the operational commitment of a full-fledged CRM, give this powerful email bolt-on a try. There’s also an iPhone app. FollowUp.cc accounts start at $4 per month, and it also works with Outlook. FollowUp.cc is a CRM in its most valuable form. Do you use FollowUp.cc? What do you think? Leave a comment and let us know! Do you have a product for our tech expert to review? Email Craig Rowe.